Esperance players celebrate winning the final with the trophy. 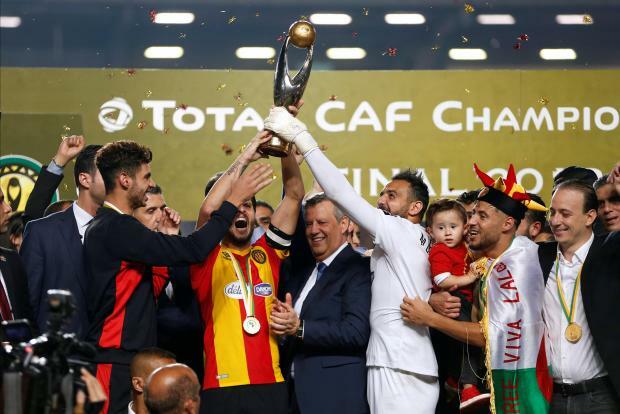 Esperance midfielder Saad Beguir scored either side of halftime to help the Tunisian side win the African Champions League with a 3-0 victory over Al Ahly of Egypt in the second leg of the final to claim the trophy 4-3 on aggregate on Friday. WHAT A GOAL BY ANICE BADRI!!!! Esperance fought back from a 3-1 defeat in last week's incident-filled first leg in Alexandria, where controversial VAR decisions clouded the outcome, to lift the continent’s top club prize in convincing fashion. The Tunisians had struggled to break down a dogged Ahly defence but made better headway as the game progressed, cheered on by a noisy 60,000-strong crowd. The 24-year-old midfielder then got the all-important second goal as he rose to head home Mohamed Ali Yaccoubi’s cross in the 53rd minute before going off minutes later with a knee injury. The second goal prompted a switch in tactics from both sides as Ahly switched to attack and Esperance immediately made changes to bolster their defence to hold onto their advantage. But Esperance caught Ahly on the counter attack with Anice Badri adding a third in the 86th minute with his eight goal of this year’s competition.